Video Courtesy of You tube User "Interviewsofinterest"
Flora Thompson, author of Lark Rise to Candleford, grew up in a tiny hamlet at the point where Oxfordshire, Buckinghamshire and Northamptonshire meet. Today, the rumble of the A43 blends with the wind bending the poplars and rippling through the fields of late-summer wheat. But walk through these tranquil fields, and spend a little time in the delightful villages nearby, and you’ll find that much of the world she both mourned and celebrated in her famous book still lingers. This is not necessarily a walk for those weaned on the BBC’s popular version of the book. If that’s what you’re looking for, you’ll need to scour the more picturesque landscapes of the West Country for a fibreglass set on a farm east of Bath. Just south of Brackley, the unnamed market town mentioned in Lark Rise, lies the village of Evenley. Its darkly Victorian church stands tall above the limes and vigorously clipped yews, its recently restored spire a testament to the power of the English village to take care of its own. Follow the dead-end lane back through the village, where it bursts open at Evenley’s vast green. You could mark out a couple of cricket pitches here and still have change for a croquet lawn. Old houses line the square, with the Red Lion pub standing proudest of all in one corner. Cut right across the green and go down School Lane. Before a row of elderly Victorian cottages, turn left, and thread your way across four cottage gardens, a paddock and a bridge, crossing the stream that fills the ancient village fish ponds. Moving on you come to Juniper Hill, the tiny hamlet, rechristened by Thompson as Lark Rise. She was born here (as Flora Timms) in 1872. The hamlet is still ringed by the juniper trees that inspired its name and lend it the fleeting appearance of a small fortress. Amid the jumble of houses, you can see Thompson’s own End House, still jutting out beyond the southern edge of the village. This private house stands with its back to Queenie’s Cottage, where Queenie the bee-keeper once enthralled the children with her stories, while the bobbins on her lacework flicked back and forth. The Waggon and Horses, where the men gathered most nights to nurse half-pints and sing songs, is now a private house called the Old Fox. Walk through the selfsame allotments that fed the landless locals a century ago, turn right at the track and follow this path to the “mother village” of Cottisford, Thompson’s “Fordlow”. Cottisford is a lovely village, stretched out on a quiet country lane. The tiny Norman church bears a plaque commemorating Flora Thompson and the pew she sat in, while next to the plaque lies another, far sadder, memorial to the villagers who died in the Great War – an absolutely heartbreakingly long list for such a small place and one that concludes with the name of Edward Timms, Flora’s brother. Continue past the Rectory and the beautiful Cottisford House, the home of Squire Rousby (Mr Bracewell in the book) and on to the junction to see the school where Thompson spent seven largely fruitless years reading, sewing and reciting, then teaching the younger children in turn. Turn right after the school, then right again back into the village. Turn left by the paddock, and follow this path through Hethe and on to Fringford, Thompson’s Candleford Green. It’s a large, beautifully kept village, whose quiet lanes are still peopled by the ghosts of Thompson’s novel. The church of St Michael has a wonderful double doorway, one Early English, the other even earlier Norman. The shops along Main Street have long since reverted to cottages, though the Butcher’s Arms beyond the green still does a good trade – an excellent lunch option. Along Main Street is The Forge, where Thompson (Laura Timmins in the BBC adaptation) worked for seven years for the irrepressible postmistress, Dorcas Lane. Heading back north, you’ll pass through the deserted village of Willaston and into the grand landscaped estate of Shelswell Manor. You get a good view of the house that Flora Thompson’s father, a stonemason, helped to build, as you pass through the grand estate. The main track then swings away from the house and leads past Lodge House at the north-west corner of the Estate. Follow the road left to Coldharbour Farm, a group of beautiful thatched farmhouses where young Flora ate lambs’ tails pie with her best friend, Emily Rose. The path goes behind the farm, heads past The Pits wood and continues back to Evenley. Just 10 miles, but a glimpse, somehow, of a slice of England; of a whole era, long passed, but not entirely vanished. Actress Olivia Hallinan, star of the BBC series Lark Rise to Candleford, was joined by fans as she paid a visit to the Oxfordshire countryside, where the character she plays grew up. For three years Olivia has played Laura Timmins, based on author Flora Thompson, whose work detailed life in a north Oxfordshire village in the late 19th century. 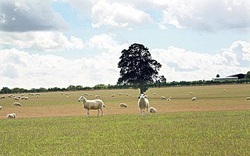 The 26-year-old star of the show made a pilgrimage to the area which inspired the series – spending five hours walking between Juniper Hill and Fringford, pictured, and meeting 20 fans. The actress, said: “I find it quite magical. I really wish I had come here three years ago when I first took on the role of Laura. I always knew that it was here, that the places were real. But I didn’t know how unchanged it would be. The Multi Talented Ladies of Lark Rise are not only famous for there acting abilities but also for Voice Overs, Click the Audio Player on the left to hear some familar voices. At first glance Lark Rise to Candleford, the BBC series, may look superficial, sentimental and soapy. But those who give it a chance often find it engaging and even addictive, as I have. It’s an exquisitely crafted and often touching chronicle of English village life around 1895. From the beginning it feels like an affectionate comedy of Victorian rural existence but gradually it unfolds as a study of yearning among people isolated by history, class and education. Each of its well-carved characters understands that life goes on elsewhere. The beautiful young heroine from a poor family, the snobbish owners of a dress shop and the local squire’s unhappy wife all resemble Chekhov characters waiting for salvation. They speak often of Moscow (or, in this case, London) as a place of magic but one they may never see. After all, it’s more than 100 kilometres away. People get from town to town mainly by walking. To show us the public spaces of a long-ago hamlet called Lark Rise and a market town called Candleford, the BBC built both places from scratch in Wiltshire parks, then filled these Lilliputian worlds with a dozen crucial characters. The plot of the hour-long episodes moves from character to character until, as the episodes mount up, we realize that we’re absorbing a small, complete world and its view of itself. In the first episode Laura, the clever daughter of a radical stone mason and his forbearing wife, moves from her family cottage in Lark Rise to become an assistant at the post office in Candleford. Naturally, Laura and her romantic future will provide the focus of several stories. Will she choose the lovable but poor labourer or the smug scion of a prosperous family? Neither, it turns out. Later she’ll be romanced by a visiting architect (who, unfortunately, must move on to his next job), then by a young man who creates Candleford’s first newspaper but reveals an imperfect character by deciding not to let the truth stand in the way of a sensational and conscience-stirring front-page story. Laura’s confidante in this and other adventures is her boss, the postmistress Dorcas Lane, played by Julia Sawalha (much cherished as Saffy on Absolutely Fabulous from 1992 to 2005). Along with her wonderfully obscure Biblical name, Dorcas is equipped with a gentle sense of irony and a remarkable ability to bring 20th-century psychology to 19th-century problems. She’s the community’s heart, everyone’s best friend, but as a spinster she feels unfulfilled. Two Platonic and highly elevated affairs with well-born men end in tears. Eventually she experiences a form of love that surprises her as much as the audience. No question, the characters are a gaggle of loquacious Victorian gossips. Yet in their lives the tarnished reputation of gossip acquires a high lustre. We realize that for these villagers it becomes a narrative folk art, a major source of entertainment, a creator of community and a way of understanding their environment. For each individual the half-hidden details of nearby lives fall into place as component parts of conscience. There’s a powerful element of pathos in the life of Flora Thompson, the author who lived this story and brought it into literature. She was born in the hamlet of Juniper Hill, Oxfordshire, in 1876. She left school at 14 to work in a post office and eventually married a postal clerk and had three children. She brought in money by writing pieces for magazines like Lady’s Companion but nourished more literary aspirations The people around her, including her parents, thought a major interest in books was eccentric at best. This left a residue of bitterness. Once she told an interviewer, “No one helped me and I have carried on my passion for literature quite alone.” The most recent biography, by Ruth Collette Hoffman, has a bleak title, Without Education or Encouragement. 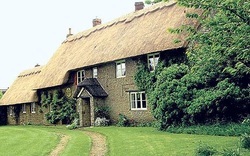 Ronald Blythe, the author of Akenfield: Portrait of an English Village, described Thompson’s writing as her way of protecting her inner life from the crushing attitude of her husband. Another writer, Hugh Casson, explained that John Thompson thought his wife’s constant reading, and her attempts to write, were pretentious and time-wasting. Finally, in her fifties, Flora wrote the books that mattered to her. She gave Juniper Hill a more poetic name, which also became the title of the first book in this series, Lark Rise (1939). She then moved with her characters to Candleford, a town based on Buckingham, for Over to Candleford (1941) and Candleford Green (1943). This trilogy has been published ever since as Lark Rise to Candleford. A reviewer in the Times Literary Supplement said she could “look back with serenity and exquisite detachment” on her youth and distil the essence of English life. She had only a little time to enjoy this warming reputation. She died at age 70 in 1947. She made sure we would all know this was her story. Creating her heroine, she changed her first name from Flora to Laura and her family name from Timms to Timmins. She used her own mother’s name, Emma, for Laura’s mother. Biographers agree that most of her characters reflect people she once knew but it’s clear that they grew and changed considerably during the 40 years between the time she knew them and the years when she wrote her books. No doubt Bill Gallagher, the BBC’s main scriptwriter, has encouraged them to grow further. In 1943 a reviewer remarked that Thompson’s readers were faithful followers waiting impatiently to learn what comes next. Viewers of the TV version fall into the same category. Recently, when the BBC announced that a fourth season was going into production, the news was greeted with on-line expressions of delight and relief. One viewer said she had bought the DVD of the first season on a whim, then had to rush back to buy the second. “I agree the series should continue for many more seasons,” she said. The first three seasons, 34 one-hour episodes, are now on DVD while the third is finishing its run on PBS. The fourth will be broadcast next winter. On one of the DVDs the producer mentions that he has enough material to fill 10 more seasons. “I hope that is true,” a viewer wrote to the BBC. “I hope it never ends! !” A clear case of happy addiction.